It’s Beginning to Look A Lot Like A Southern Christmas! 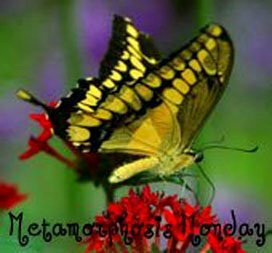 Merry Met Monday and Creative Monday! 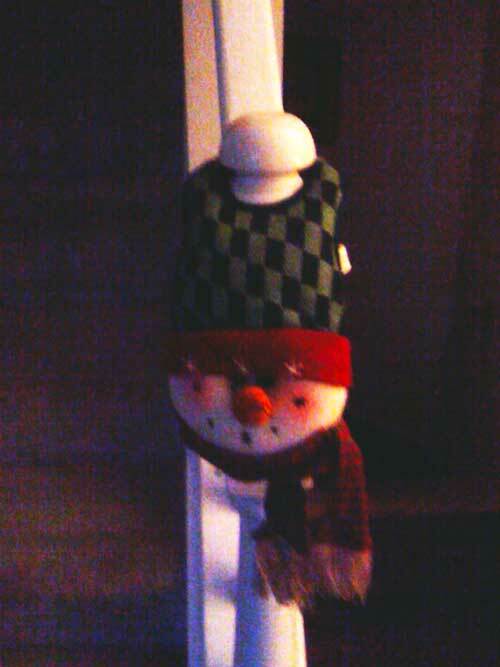 At our home, we generally wait a little later to decorate for Christmas. However, my mother and my nephew have already gotten off to a good start transforming their homes into Christmas wonderlands! Don’t you just love it when that happens? There is still some left to do but here is where they are so far. The Christmas tree is up, lit and ready for decoration. 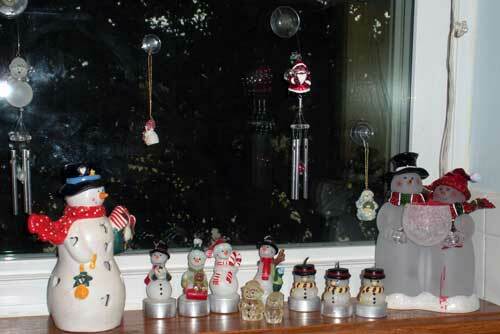 The kitchen window is full of snowmen (and women)! I love the Swarovski. My husband, Joe and I started the collection for my mother and have added to it through the years. The little crystal Santa has blue eyes! Mama got these just this year. Aren't the globes with the poinsettias beautiful? 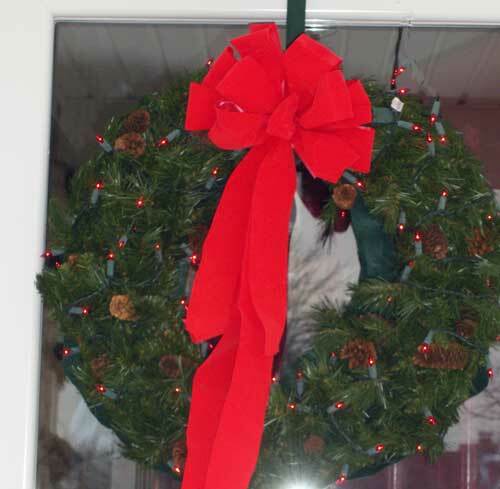 A wreath on the front door with pretty red lights and a pretty red bow. 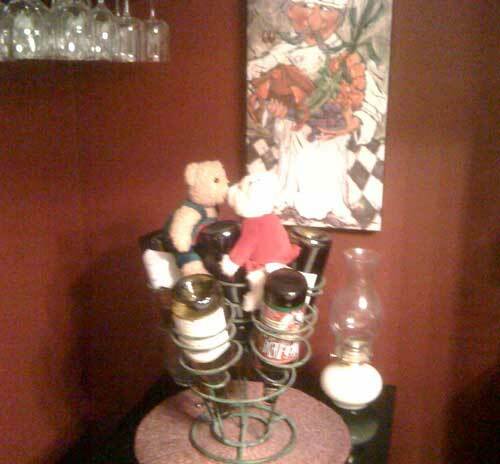 I like that he sent me this picture of a unique wine rack that has been decorated for Christmas. 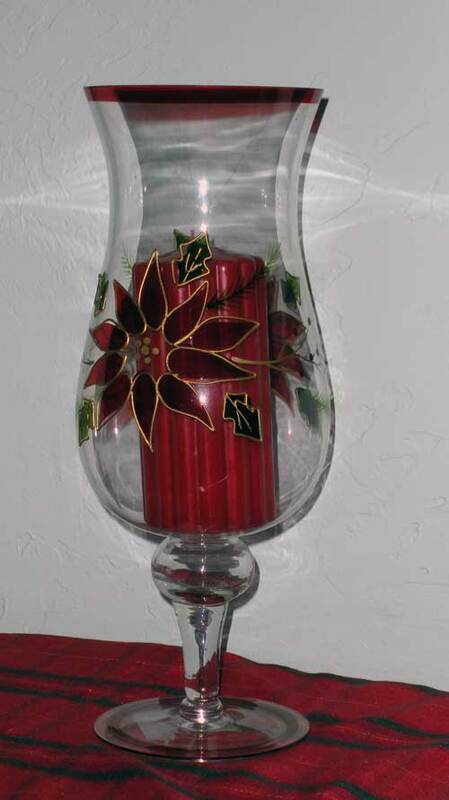 This was a shower gift to Bryan and Shara from my husband and me. 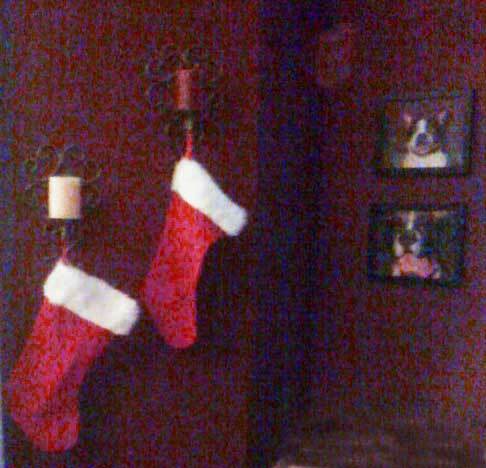 The stockings, next to the pictures of the doggies, Buddy and Buster. 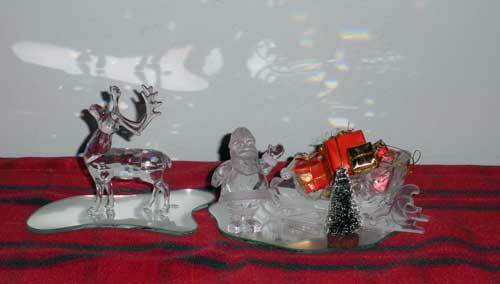 A cute little reindeer adorns a side table. 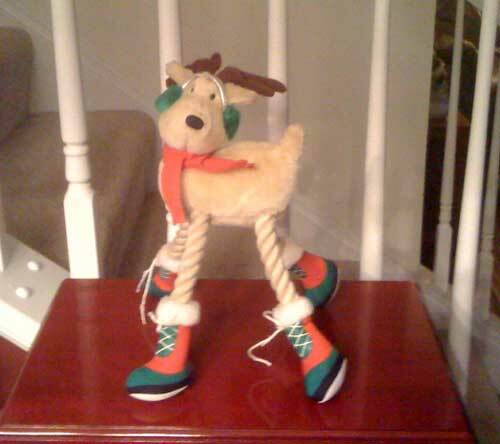 And, Frosty greets you as you start your climb up the stairs. I’ll be bringing you more pics from my family’s decorations and mine as well throughout December. What a fun time it is. 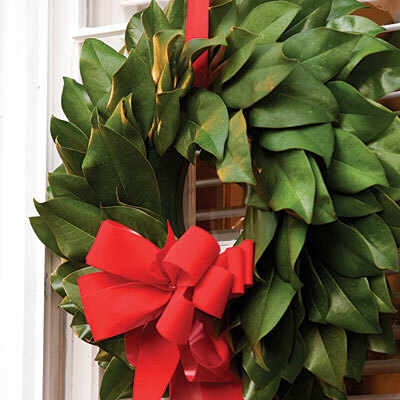 If you have a Magnolia tree, or there is one in the neighborhood that you neighbors would not mind you borrowing from, make this pretty Magnolia Wreath as described on Southern Living online. I remember my music teacher in high school, Betty Woods, saying what a special time of year this is and that we should take time to notice how the starts were brigher and the air was crisp and the whole earth celebrates. She probably wondered why she bothered telling this to a bunch of crazy teenagers, but all of these years later, I still remember and love to go outside in December and see that what she said is true! From the Biltmore Estate – Yummy! 1. Drizzle chocolate sauce on a chilled martini glass. 3. Garnish with a miniature candy cane or chocolate shavings. So pretty–thanks for linking to the party. I will click to follow and add you to my subscriptions if you have that feature on your blog. I am both following and subscribing? Check out my blog for the Google update. You must have had some of that Christmas Cookie Cocktail when you took that first picture-hee hee. I love all the snowmen. My heart pitter patters for snowmen. The magnolia wreath is outstanding! So simple, so unique, and so elegant! I like all the decorations, and I love that you started your Mom on such a pretty Christmas collection! Cute decorations, I love the magnolia wreath. Thanks for sharing. Thanks for the magnolia wreath link! Oh, I love, love, LOVE the magnolia wreath! Thanks for sharing. Everything is shaping up nicely. I like the stockings hanging from the sconces. OHHHH this makes me want to get all my Christmas stuff out of storage 🙁 Haven’t done that “completely” since I left Dallas 6 years ago! I must do that soon!!! Christi, I didn’t know Brian was so well-rounded. I know you’re so proud of him. I still remember him as a little boy and the story about the 3 wheeler and the barbed wire fence. At least I think I remember something like that . . . my memory is going down hill fast! The Christmas decorations are beautiful. I love your website! I love the wreath! You are way ahead of me on decorating. I’ve got to get my guys in gear to help me with those boxes. Thanks for a great inspirational post. Love your decorating and it appears you are way ahead of me !